Make the affordable choice when you need new floors by coming to our warehouse showroom for vinyl flooring. Our products are not only reasonably priced to suit any budget, but they are durable and stylish. Available in many colors and designs, vinyl floors cater to your budget and needs. This flooring option offers more possibilities than ever before. Whether you want bold hues or complementary colors to match your existing home décor, you’ll find the perfect vinyl flooring product at our store. Come to our showroom to browse hundreds of selections. In addition, vinyl can look exactly like other flooring products. Imitating natural wood, stone, or ceramic, you have so many styles to choose from. Our flooring professionals are always on hand if you need help finding the right floor for your home or business. Your busy home needs a floor that can take care of itself! 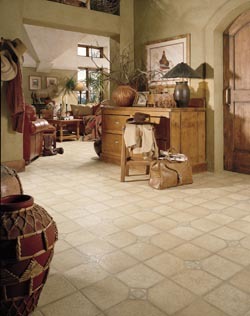 Vinyl flooring is a resilient product product that stands up to heavy foot traffic, moisture, and scuffs and scrapes. Because your new vinyl floor is durable and requires minimal maintenance, it makes your job easier. It’s the perfect choice for families with children and pets, because it endures running, rough-housing, and playtime. Why is vinyl flooring so tough? Due its manufacturing process, vinyl floors effectively resist scratches, scuffs, and stains. At the same time, cleanup is easy. Simply sweep or dry-mop and then occasionally damp-mop. Vinyl is the no-fuss solution that is perfect for home and business owners throughout the area. Enjoy the rich beauty of wood without the price tag. For a quality product that is easy to install and maintain, choose a luxury vinyl plank floor. Not only does this flooring type mimic hardwood, but it is easy on your budget. At the same time, it does not require nails to install. Vinyl plank simply locks into place and is installed right over your sub-floor. Our vinyl flooring installation experts always prep the area perfectly before beginning work. After all, property installation ensures a long-lasting floor. Create appeal in your room with a new vinyl plank floor that looks and even feels like natural wood. Add some style and sophistication to your home with luxury vinyl tile flooring that has the look of natural stone or tile. This elegant flooring product increases the value as well as the appeal your property. In addition, luxury vinyl floors (LVT) are comfortable underfoot. For something smooth, stylish, and affordable, LVT is the perfect option for many residential and commercial customers. Like traditional vinyl flooring, LVT is also durable and long lasting. Make sure your new floor is installed correctly. Choose us for professional vinyl flooring installation. We offer a lifetime guarantee with our installation services. If you have an installation-related problem during the life of your floor, we’ll repair it for you. We feature top-quality products, affordable pricing, and convenient installation services to ensure your complete satisfaction. Contact us for more information about our special offers. We serve customers in Anderson, Greenville, Easley, Clemson, and Seneca, South Carolina.